21 Do not fear, O land, rejoice and be glad, For the LORD has done great things. 22 Do not fear, beasts of the field, For the pastures of the wilderness have turned green, For the tree has borne its fruit,The fig tree and the vine have yielded in full. 23 So rejoice, O sons of Zion, And be glad in the LORD your God; For He has given you the early rain for your vindication And He has poured down for you the rain, The early and latter rain as before. 24 The threshing floors will be full of grain, And the vats will overflow with the new wine and oil. 25 "Then I will make up to you for the years That the swarming locust has eaten, The creeping locust, the stripping locust and the gnawing locust, My great army which I sent among you. 26 "You will have plenty to eat and be satisfied And praise the name of the LORD your God, Who has dealt wondrously with you; Then My people will never be put to shame. 27 "Thus you will know that I am in the midst of Israel, And that I am the LORD your God, And there is no other; And My people will never be put to shame. Be glad, O people of Zion, rejoice in the LORD your God, for he has given you the autumn rains in righteousness. * He sends you abundant showers, both autumn and spring rains, as before. And ye sons of Zion, joy and rejoice, In Jehovah your God, For He hath given to you the Teacher for righteousness, And causeth to come down to you a shower, Sprinkling and gathered – in the beginning. Both are similar to the Norwegian translation, as distinct from New American Standard Bible 1995. There were many false prophets in Israel - through the whole history really. Some times it even flourished of them. You have probably read about the prophet Elias and his meeting with Ba'als prophets at the mount of Carmel - where 450 of them gathered. And one of the Lords prophets. Also the New Testament congregation will flood with false prophets, false witnesses! Flood! No, it will just be about one here and one there? Let us just hear what the Word says about it -first a word from Jesus Himself: "Many false prophets will go out and many will be seduced." We discover here that the word many are used twice - many will seduce, and many will be seduced! And so from the apostle John: "Beloved, do not believe every spirit, but test the spirits to see whether they are from God, because many false prophets have gone out into the world." (1 Joh. 4:1). There's that word again: Many! If we were to see the old testament congregation as an ideal - which is our call - then these will clearly be in majority! It's so easily done for us, to make a mistake when it comes to the false prophets. We know something that distinct them: "Her prophets have smeared whitewash for them." (Esek.22:28). They glorify the situation! As we also read in the prophet Jeremiah: "They have healed the brokenness of My people superficially, Saying, 'Peace, peace, But there is no peace." (Jer.6:14,18). But now you shall hear what the Lord Himself witnesses through His prophet Isaiah: "Creating the praise of the lips Peace, peace to him who is far and to him who is near,"Says the LORD, "and I will heal him." (Is.57:19). But isn't that the same message then? Yes, surely it is! Therefore it is so easy for us to get it wrong! There are many who are afraid to believe the Gospel as it reads, because then they believe that something must be wrong! But if they can just get a bit of some strict preaching - some "seriousness" into it - yes, then they believe it's right! Then they have peace with God - they think - during times it seems as though things are going right for them, but no peace and anxiety, when things go bad - yes, perhaps right downhill, as he writes in his song, Marius Giverholt. They can't see that this is the peace that the world gives, and that they are strangers to the peace Jesus gives! Well then, how was it with these false prophets? It wasn't that they preached peace - but the foundation upon which they were preaching peace! Notice the foundation! They preached that God was satisfied with the people! That He was satisfied with their deeds and sacrifices! If they only did what was required of them, then God was content with that! They led the people to believe that God was satisfied with their works from the law! We are not speaking about the prophets of Ba'al, who was completely idolatrous, but the kind that spoke in the Lord's name. They didn't even preach what these sacrifices in Israel spoke about. And that was because they didn't understand themselves! Many of these prophets were pure "food priests" - they predicted and prophesied for money and gifts. But for many it wasn't pure evil will that laid behind - they really believed that they were priests and prophets, and that what they were preaching really was the word of God. But there were something they lacked - that which the Lord spoke about in our passage: "- the teacher for righteousness." The Holy Spirit! The Spirit of truth, which Jesus spoke of. "For He has given to you the Teacher for righteousness," we read. A prophetic word! Listen to what Jesus says to His disciples: "When the Helper comes, whom I will send to you from the Father, that is the Spirit of truth who proceeds from the Father, He will testify about Me." (Joh.15:26). Then you see who He is, He who is mentioned in our passage here? But He said something specific bout this teacher whom He was going to send to His people - He is the teacher for righteousness! That was what the false prophets lacked - they didn't preach conversion! They didn't teach God's righteousness! Most of Israel was under this during the time of Jesus as well. The Apostle Paul preaches about his kinsmen, his fellow countrymen Rom. 9,3: 11,14), the Jews: "Brethren, my heart's desire and my prayer to God for them is for their salvation." Who is he praying that intense for? What kind of people are they? Listen: "For I testify about them that they have a zeal for God," - and so you hear the reason for his intense prayer: "but not in accordance with knowledge. For not knowing about God's righteousness and seeking to establish their own, they did not subject themselves to the righteousness of God." (Rom.10:1-3). It was something they obviously lacked, right? Exactly "the teacher of righteousness!" If they had owned Him, they would have seen what the apostle testifies further in verse 4: "For Christ is the end of the law for righteousness to everyone who believes." (Rom.10:4). Luther experienced this as well and it caused the whole reformation. He saw what it says in Rom.1:16-17: "For I am not ashamed of the gospel, for it is the power of God for salvation to everyone who believes, to the Jew first and also to the Greek. For in it the righteousness of God is revealed from faith to faith; as it is written, "BUT THE RIGHTEOUS man SHALL LIVE BY FAITH." (Rom.1:16-17). Who hosted the poor monk in his need here? It was the "teacher of righteousness!" He who convinces you of the name of Jesus, as the prophet Jeremiah reveals it: "In His days Judah will be saved, And Israel will dwell securely; And this is His name by which He will be called,'The LORD our righteousness.' (Jer.23:6). It is the name of Jesus! Shout it out! Listen: He who sits in heaven today, bears the name: The LORD YOUR righteousness! Luther was set free completely by this sight - and as mentioned before, the whole reformation to salvation for thousands upon thousands, if not millions, followed this one thing that the Gospel shone in all it's glory! There are crowds of "Christian people" - and then i put the term Christian people in mimic sign - which recedes when the Gospel is preached "too free," as they call it. They are afraid of that! What is it that lack in these people? It cannot be anything else than the "teacher of righteousness!" That's really a serious matter! Let us hear what Jesus testifies about this teacher! : "But the Helper, the Holy Spirit, whom the Father will send in My name, He will teach you all things, and bring to your remembrance all that I said to you." (Joh.14:26). What has Jesus said to you then - about your salvation? : "It is finished!" (Joh.19:30). "When the Helper comes, whom I will send to you from the Father, that is the Spirit of truth who proceeds from the Father, He will testify about Me," (Joh.15:26). John the baptist - he who was filled with the Holy Spirit while yet in his mother's womb (Luk.1:15) - he testifies of Jesus, and listen! : "Behold, the Lamb of God who takes away the sin of the world!" (Joh.1:29). And: "I myself have seen, and have testified that this is the Son of God." (Joh.1:34). It is no less then the Son of God who has carried your sins! The "teacher of righteousness" testifies of that. And then Jesus own words again: "But I tell you the truth, it is to your advantage that I go away; for if I do not go away, the Helper will not come to you; but if I go, I will send Him to you." (Joh.16:7). It's to our advantage that He comes to us - because then we will see what's done to our salvation. What causes our salvation! We have to take with us what Jesus says about His task considering this world - what He must convince them about. Sin, righteousness and judgment! And then He says something about what sin is: "Concerning sin, because they do not believe in Me." (Joh.16:9). Now one thing are these seduced people, who believe that they have the Holy Ghost, even though they defy His teaching about sin, and live free in what the word of God forbids - something even more tragic is all of those people in the believing congregation, throughout the whole history, who has taken this very serious, has adapted after what they have seen in the word of God - yes, even died as martyrs , but have not learned what the righteousness of God is! How can you live with God, but not believe what the Spirit of Truth - the Spirit of mercy - teaches you about Him! How can you take part in God's righteousness, if you don't believe what the "teacher of righteousness" preaches unto you! "Be glad, O people of Zion, rejoice in the LORD your God, for he has given you the teacher for righteousness. He sends you abundant showers, both autumn and spring rains, as before." Listen to it one more time: "For He has given you the teacher for righteousness. And then He pours down...!" (Norw. transl.) Which means when they have learned the righteousness of God, and are taking part in it! Then the blessings flow over them! Because it is in Him, Jesus Christ, the blessing are! It is in Him we are blessed! What are we really reading about here? We read about true conversion! That is something the Lord works in a humans life as He convinces it about His righteousness - that which is revealed to us, in the Gospel! (Rom.1:16-17). "My people will never be put to shame." In Norw. transl. : Never in eternity! It is mentioned here twice almost on top of each other! Never in eternity! Listen! Never, and in eternity! It shall never happen! Because you have by the Holy Ghost's work and enlightenment taken your refuge in Him, who is the truth! And the truth will never be put to shame! Joh.3:15 and 16 "-Whoever believes in Him will have eternal life." Any reason for joy? You who are placed under death! Eternal life - for free! Joh.3:18: "He who believes in Him is not judged." Any reason for joy? You who have sinned, again and again - is not judged! Acts 10:43: "- through His name everyone who believes in Him receives forgiveness of sins." Any reason for joy? Not a demand of perfect righteousness - but forgiveness of sins! 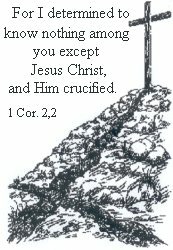 Rom.4:24: "- but for our sake also, to whom it (the righteousness) will be credited, as those who believe in Him who raised Jesus our Lord from the dead!" Any reason for joy? We will be credited what Jesus alone owns - a perfect righteousness! Rom.9:33: "BEHOLD, I LAY IN ZION A STONE OF STUMBLING AND A ROCK OF OFFENSE, AND HE WHO BELIEVES IN HIM WILL NOT BE DISAPPOINTED." You will not! Rom.10:11: "For the Scripture says, "WHOEVER BELIEVES IN HIM WILL NOT BE DISAPPOINTED." 1 Pet.2:6: "BEHOLD, I LAY IN ZION A CHOICE STONE, A PRECIOUS CORNER stone, AND HE WHO BELIEVES IN HIM WILL NOT BE DISAPPOINTED." But you knew all of this didn't you? Well then be glad and rejoice in this! It isn't dangerous! But it is dangerous not to! "And to whom did He swear that they would not enter His rest, but to those who were disobedient? So we see that they were not able to enter because of unbelief. Not able to enter! "Therefore, let us fear if, while a promise remains of entering His rest, any one of you may seem to have come short of it." Did you hear that? Remains! While a promise remains! "For indeed we have had good news preached to us, just as they also; but the word they heard did not profit them, because it was not united by faith in those who heard. For we who have believed enter that rest," We who have believed! "just as He has said,"AS I SWORE IN MY WRATH, THEY SHALL NOT ENTER MY REST," although His works were finished from the foundation of the world." (Hebr.3:18-19, 4:1-3). What kind of deeds are required of you then? Oh what a message! "His works were finished from the foundation of the world." Well, i don't want to be in disbelief you may say. Then you probably aren't either? But i am so insecure of my faith! But that is not what the word of God calls disbelief! Listen: "- if not to those who disobeyed." Who don't want to believe! I am also insecure if i look at my own faith - but you aren't insecure if you look at Him you have your faith in, are you! Let us pray about this: "Lord, give us the teacher for righteousness!"